In his book Leap First: Creating Work that Matters, branding guru, and author, Seth Godin invites us to consider two choices that guide our lives: Safer or Better. Safer leads to security and comfort from the planned and predictable. Better involves taking risks in unpredictable situations to make a difference. In this world of disruptive change, Seth warns of the costs of playing it safe. His framework distinguishes between comfort zone and safety zone. Today, playing it safe is actually riskier and taking risks may be the safest path — at work, in our career, and especially in learning. Our methods of learning, however, have this backward. Education is all in the “safer” bucket. It involves training and planning for the predictable. It requires skills that optimize comfort and security. The result is to avoid risk and reinforce our knowledge. The “better” barrel, however, involves making a difference. It requires taking risks to learn and unlearn the skills necessary to create in unpredictable situations. The result is to seek out risks that question and challenge our knowledge. Actual learning that makes us better, requires growth, not just training. And growth is uncomfortable. We struggle to move from what we know to what lies in the unknown. We stretch our boundaries and become more, become better. Learning today makes us better precisely because it isn’t safe, comfortable or predictable. Through challenging topics and experiences that encourage struggle, confusion, and discomfort, we grow by taking risks and losing ourselves. Growth makes us better, but first, it requires unlearning and self-discovery, which can be most unsettling. An uncomfortable question or topic followed by a silent pause provides the struggle to shake up settled minds. Seeking questions rather than rewarding answers will confuse learners that expect teachers to spoon feed them “knowledge.” Requiring learners to risk themselves and fail, or try something new will shed those old playbooks that place getting a grade over taking a risk and self-discovery. Any gleam of self-discovery opens us to let go of outmoded views, beliefs, and assumptions, many closely tied to our identity. Continual learning will find us not recognizing ourselves! 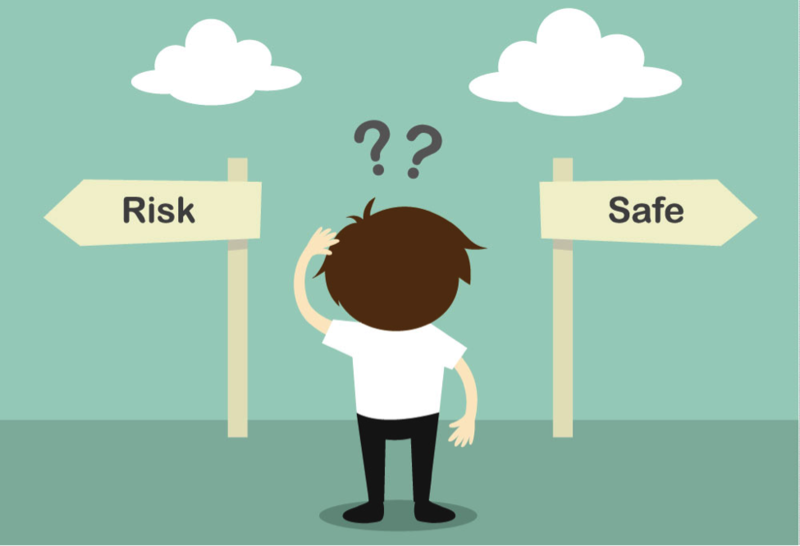 Most well-meaning professionals believe that only in safe environments can we take risks. But safe environments are designed to protect us from risk and loss. For whom are these “safe” environments designed, teachers or learners? The preoccupation with safety actually avoids any risk or suffering in favor of protection and comfort, avoids growth for the predictable, and avoids the unknown for security. Instead of focusing on safety that ensures comfort and security, we need a space that unifies a shared commitment. Not to protect from, but to encourage, struggle: to foster self-discovery, and engage the irritation essential for growth. 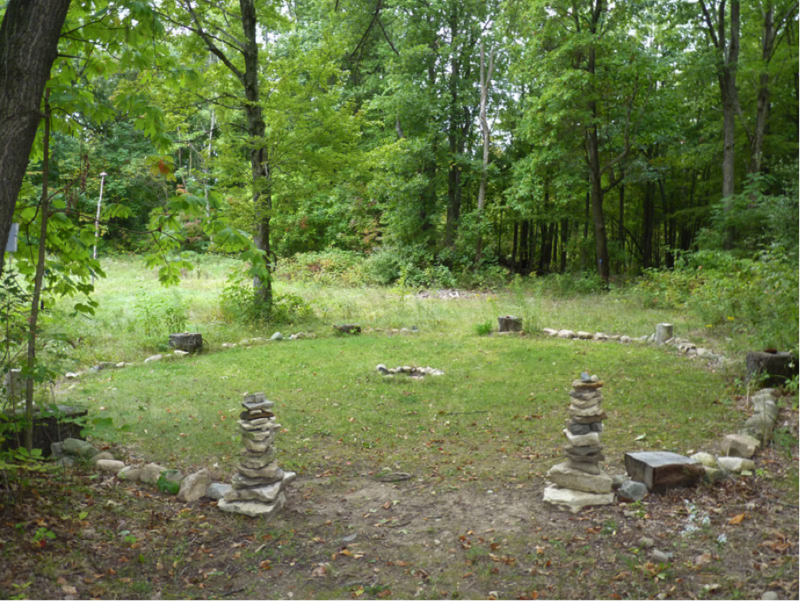 Sacred spaces are intentionally designed to embrace self-discovery — to guide us inward to see ourselves newly. A short exploration of Safety and Sacred reveals this shift. Safety: the condition of being protected from, or unlikely to cause, danger, risk, injury, or loss. The condition or feeling of being safe, certain or secure. Secure from the threat of danger, harm, or loss. Unlikely to produce controversy or contradiction. Sacred: devoted exclusively to a single use, purpose or intention; worthy of respect, or dedication. Unlike Holiness or sanctity, which refers to a divinity or deity, “sacredness” refers to objects, places, or happenings. In Emile Durkheim’s theory, sacred represented the interests of the group, a solidarity, and unity, embodied in group symbols. In Theravada Buddhism sacred designates a ‘noble person’ depending on their level of purity, which for Buddhists reveals the level of attained dharma (teachings) practice. What we are seeking here instead is a sacred space. Sacred as a commitment demands rigor and purpose. It is designed to challenge, discover and grow. Its nature requires introspection and vulnerability with rigorous practice and mutual respect. Such a commitment establishes ground rules and sets conditions and expectations that encourage risk. Exposed and vulnerable, we accept challenges and become accustomed to discomfort. Absent this commitment, however, Sacred, too, can be reduced to just another “educational” goal or outcome to be marked and measured. Sacred as an observed output looks very different than when supported as an intentional input. OUTPUT: As an outcome, sacred is reduced to a result under the mistaken goal that achieving it will then lead to learning. This mistake causes missed opportunities to confront views or challenge assumptions. As a “result,” our focus is on caution and harmony, and avoids the very risk and struggle that generate growth. To prevent sacred from becoming just another result, we must hold it as an intention. INPUT: As an intention, sacred is an input to guide the conditions that impact growth. 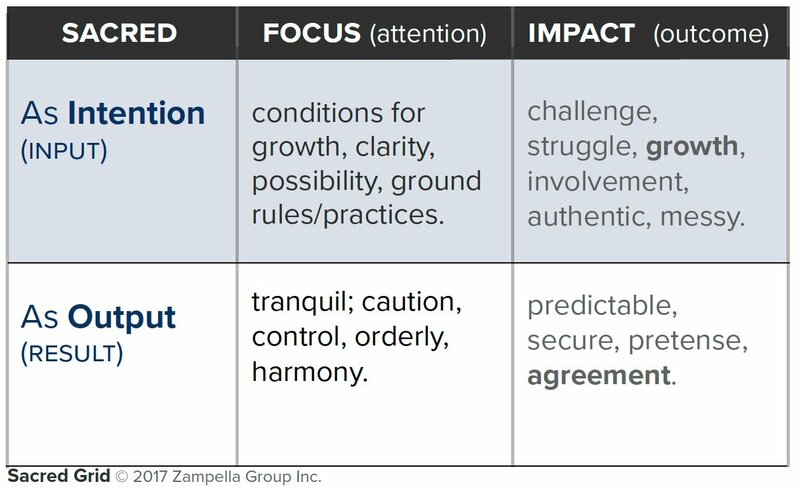 Guided by that intention we let go of the result and focus instead on impacting learners through conditions, guidelines, and ground rules that encourage struggle, challenges, and unpredictable growth. Sacred and safe seem similar. Still, what motivates each is subtle yet can encourage or diminish growth. Consider that concerns of safe-comfortable stem from “caution” while concerns of sacred-challenging stem from “care.” One avoids; the other embraces. The nuance here shapes what’s possible, and fosters what can emerge. In sacred spaces, we support each other from a commitment to discover and grow. We notice and confront any triggers, confusion, or reactions caused by new content. We move toward these reactions to discover the source. We engage what emerges and grow from it. Think of it this way. The caterpillar must endure its chrysalis cycle. Lessen its struggle – by slicing open the cocoon to release the butterfly – and we’ve harmed its essence. What emerges will not have developed the muscles required through a necessary struggle to span the wings to fly. Cocoons are sacred places, not to avoid but to sustain the necessary struggle in a singular purpose – a space for rigor, ritual, and rite of passage. Tony Zampella is the learning specialist at Zampella Group, which serves Learning & Development Professionals. As an instructor, researcher, and designer of learning programs and practices, his work develops mindsets for growing a culture of servant leaders.